Believe it or not, social media is a great tool for dentists to have in their arsenal. Why? Because it provides them with the ability to communicate, engage and outreach to their local community in a fun and humanistic way. 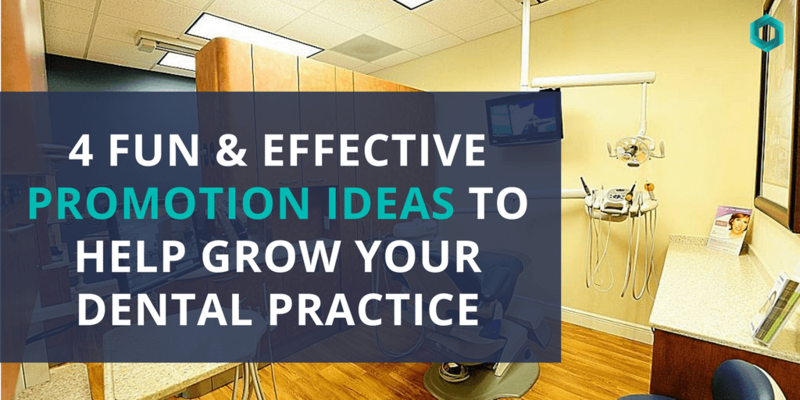 Understandably, not all dental posts are fun nor are they the “must-read” for the everyday individual which is why many practices find it difficult to grow your their followers or gain new leads from it, but there are ways to change that. With local competition growing everyday, dentists must find new and fun ways to gain their local communities attention and attract them into becoming on-going patients. Here are 4 fun promotion ideas that you can train someone in your staff to run and initiate on either a monthly, quarterly or yearly basis. A cavity-free club is a great way to inspire children to keep their young smiles healthy, and help change their perspective of what it means to “go to the dentist”. The goal is for your young patients to come in for their 6 month cleaning and routine check-up without any cavities. If they are successful in this goal, they are rewarded with a small prize. You can either reward each patient after their visit or hold a monthly raffle in which your cavity-free patients are entered to win one grand prize at the end of the month. Promoting your cavity-free club on your social media platforms such as Facebook and Instagram will help in providing you with an attractive tool to capture the attention of new and patients who have fallen out. But you can’t just say “Hey! Join our cavity-free club!”, the best way to grow it and put it into effect is to showcase the winners to your audience, encouraging them to engage with your page and posts. Also encouraging them to share their photo on their own timeline to reach a larger and newer audience. Does your dental practice offer any take come dental care kits that you know would grab the attention of prospective patients? Do a giveaway! For example, Acosta Dental Arts is really big on teeth whitening and not only wanted to promote the service but the fact that they are now a Glo Science Teeth Whitening provider. So we put together a small Facebook campaign to showcase the giveaway with pictures of the product and the value of it. The goal was to get more page likes, post engagements and increase brand awareness around their community. Word-of-mouth is still one of the biggest influencers to a business’ success. We trust in the fact that our friends and family won’t steer us in the wrong direction, and it helps cut down the research process on our part. So how can you express your gratitude to your “fans”? Reach out to them and reward them. Referral rewards are long-running promotions that are easy to start. The best and easiest way would be to purchase gift cards (i.e. Starbucks, supermarket and chipotle cards are very popular) and offer them to those who successfully refer new patients to your practice. Make sure to promote your Referral Rewards program on social media through engaging pictures, live videos and stories – remember, repetition is key! When new patients come into your practice, always make sure to ask if they were referred by a current patient, if so, make a note to reach out to them to let them know they can claim their prize. Reaching out and connecting with the referrers are important, because it shows them that you will follow through on your end and it motivates them to keep referring. *Please make sure that your state allows referral incentives for medical services. How many times have you either posted or seen a back-to-school photo on your social media stream. If your audience is already doing this, why not tap into it and have them engage with your practice? This promotion is already halfway completed for you, what you must do is invite your patients to tag your business with a picture of their young ones showing their pearly whites when being dropped off at school or waiting for the bus. A winner will be picked at random and you can announce the winner through a live video, an Instagram or Facebook story and then share a picture of the winner holding their prize. Effectively running a campaign and managing social media platforms is a full-time job which is why we are here to help take the load off, but in order for us to be successful it requires effort on your part as well. We can help plan and execute your campaigns and posts, and provide you with new ideas to engage and grow your following but there is only so much we can do on our end. Since we are not at your practice we will educate you on what you should post as well and why – for example some behind-the-scenes live videos of procedures! If you’re ready to learn more on how we can help you and the different online marketing services we offer dentists, contact us today.